At BRE, customer satisfaction is paramount. We value feedback and strive for continuous improvement. Emin Bulk Haulage is a family owned business and we have two complete end tipping pocket trains built by BRE and are extremely happy with them. The tare weight is minimal on all the equipment allowing us to transport payload for profit not steel for no return. Damion and his team at BRE offer great service and are great to deal with; they continue to make small modifications to improve their products to benefit our operations. Build Quality – very good standard of build for trailers with a view to lasting the long term operating environment within CBH. Customisation – BRE have met all of CBH’s specific needs and requirements in providing tailor made trailers. We have a large network to support and not all trailers will suit everywhere or everything within CBH. BRE have more than met our special requirements to suit our transport needs. Overall – being a grower owned company we are always looking into ways to improve grower value. BRE enable CBH to provide grower value by delivering a quality product at competitive price; as well as allowing CBH to support local rural communities in the Wheatbelt. GMT are staunch advocates of the BRE end tippers. The lighter tare weight whist maintaining structural integrity, converts into extra payload and revenue compared to other trailers in the fleet. This extra income roughly equates to the finance costs of the trailers. This is a significant saving per combination per annum. We are a Port Hedland based family earthmoving business, and have been dealing with Bruce Rock Engineering since 2006. In this time we have purchased over 250 side tippers and three industrial buildings for both the Bullbuck and Brookdale fleets. Damion and the team have been able to design and build trailers to suit our exact requirements; its like having our own in house manufacturer. Also after-sales back up and support are a big factor when operating in an environment like the Pilbara. 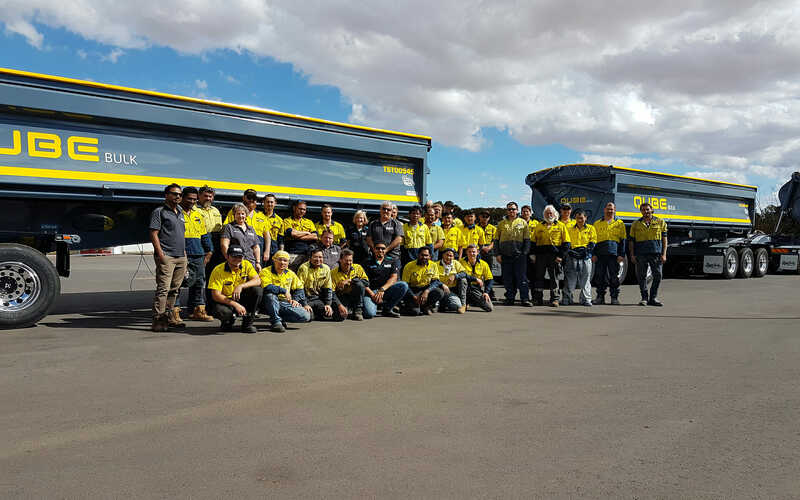 With Bruce Rock Engineering’s new repair & maintenance facility in Port Hedland they offer the complete package.